A linkage map for the Newt Notophthalmus viridescens: Insights in vertebrate genome and chromosome evolution. Title A linkage map for the Newt Notophthalmus viridescens: Insights in vertebrate genome and chromosome evolution. Genetic linkage maps are fundamental resources that enable diverse genetic and genomic approaches, including quantitative trait locus (QTL) analyses and comparative studies of genome evolution. It is straightforward to build linkage maps for species that are amenable to laboratory culture and genetic crossing designs, and that have relatively small genomes and few chromosomes. It is more difficult to generate linkage maps for species that do not meet these criteria. Here, we introduce a method to rapidly build linkage maps for salamanders, which are known for their enormous genome sizes. As proof of principle, we developed a linkage map with thousands of molecular markers (N=2349) for the Eastern newt (Notophthalmus viridescens). The map contains 12 linkage groups (152.3-934.7cM), only one more than the number of chromosome pairs. Importantly, this map was generated using RNA isolated from a single wild caught female and her 28 offspring. We used the map to reveal chromosome-scale conservation of synteny among N. viridescens, A. mexicanum (Urodela), and chicken (Amniota), and to identify large conserved segments between N. viridescens and Xenopus tropicalis (Anura). We also show that met1, a major effect QTL that regulates the expression of alternate metamorphic and paedomorphic modes of development in Ambystoma, associates with a chromosomal fusion that is not found in the N. viridescens map. Our results shed new light on the ancestral amphibian karyotype and reveal specific fusion and translocation events that shaped the genomes of three amphibian model taxa. 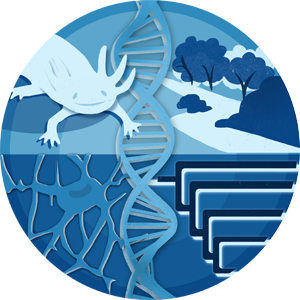 The ability to rapidly build linkage maps for large salamander genomes will enable genetic and genomic analyses within this important vertebrate group, and more generally, empower comparative studies of vertebrate biology and evolution.